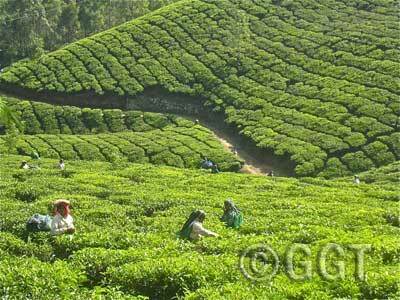 Tea Plantation, Munnar, Kerala, India (photo by Geringer Global Travel, India tour operator). Tea and coffee are two of the most popular drinks in the world, and India is at the very heart of the production of these ubiquitous beverages. The country is the largest exporter of tea in the world, and it remains a huge part of the culture. Coffee is the upstart on the Subcontinent—specialty coffee houses are becoming ever more prevalent in India, in large part because of the high-quality coffee produced here. On this tour in South India, join Geringer Global Travel as we introduce you to the captivating subculture of Indian life: where the magic of tea and coffee come to life. Discover the tea plantations and idyllic towns around Munnar, and gain insights into the intricacies of the tea trade. Wander the fields of Coorg, the air redolent with coffee and spice, and learn all about the process of creating one of the world’s best-loved drinks. And this journey is about more than just leaves and beans: you’ll walk through jungles and experience the history of ancient cities. You’ll float through Kerala’s backwaters on a houseboat and search for elephants in a national park. Let your senses come alive on this South India tour. Begin your South India tour by exploring Bangalore, including Lalbagh, a 240-acre botanical garden; the imposingVidhan Soudha, seat of Karnataka government; and the Bull Temple, an impressive edifice carved out of a single granite block. Later drive to Mysore, with a stop at Srirangapatnam. This is where the legendary warrior Tipu Sultan built his island fortress and the Summer Palace, well known for its elaborate interior decorations. Experience more of Mysore, a charming city with a princely past. Visit Chamundi Hill—where Nandi, a huge monolithic image of Shiva’s Bull, is always garlanded with flowers left by devoted Hindus—as well as the famedChamundeeswari Temple. In the afternoon, check out the Maharaja Palace, which is one of the most visited monuments in India. You’ll also visit Devraja Market, immersing yourself into Mysore daily life. Drive to Coorg, a mountainous area with a distinctive, independent spirit and a fascinating past. Pick strawberries, stroll through a coffee plantation, and cardamom patches amid fluttering butterflies. This is an uplifting glimpse into a life lived off the land. The rest of your day is at leisure. Experience the planter’s life, as you enjoy a guided tour of the 300-acre working coffee plantation on foot. Learn firsthand the difference between Arabica and Robusta, discover how the Malabar blend got ‘monsooned’ and more. You’ll also visit a nearby Tibetan settlement, where you’ll learn about Tibetan culture and history. This morning drive Wayanad, where you’ll stay at the eco-friendly Vythiri Resort. Surrounded by a tropical rainforest, the resort is ideally located to take advantage of trekking trails, nearby plantation tours and tribal village visits. You can also take part in yoga and meditation sessions or visit the many other attractions in Wayanad. There is so much to do in Wayanad. It is perfect for nature lovers: the rugged, dense forests, deep valleys, spectacular waterfalls and mountain streams all make for great trekking and adventure sports. You can also visit some of the wildlife sanctuaries, as well as the Edakkal Caves, Neolithic caves adorned with petroglyphs. We depart for Cochin. Founded in 1341, this was a principal harbor for the Malabar Coast’s vigorous spice trade. Given its location on the main trade route between Europe and China, the city is replete with fascinating sights, sounds of stories which you’ll uncover during your stay. In the evening, witness the most elaborate dance form in southern India: Kathakali. Visit the Dutch Palace (also known as Mattancherry Palace), which was built by the Portuguese and presented to the Raja of Cochin in 1555 AD. Explore the 16th century Jewish Paradesi Synagogue, the oldest synagogue in India, and see the famed Chinese Fishing Nets and St. Francis Church. In the afternoon, enjoy a cooking demonstrationfollowed by lunch with a local family. Your tour in South India continues as you drive to Munnar in the morning. Sprawling tea plantations, picturesque towns, and winding lanes make this a popular resort town—just as it was as for the British government when they used it as a vacation getaway. The afternoon is yours to relax in this beautiful place. This morning, visit a tea factory as well as the Munnar Tea Museum. The museum outlines the development of Munnar tea estates, from erstwhile tea rollers to the modern, fully automated tea factory. In the afternoon, trek to some tea plantations, perhaps watching the harvesting of leaves by workers. Enjoy the sunset in this serene setting before returning to the estate. Head to Thekkady today, and prepare to explore the Periyar Tiger Reserve. Declared as a Tiger Reserve in 1978, this is one of South India’s most popular wildlife reserve. Set off for an invigorating nature trek, traversing diverse habitats with the guidance of your naturalist. This is anexcellent opportunity to spot birds, butterflies and other wildlife. In the afternoon, explore the spice plantation in Thekkady, where you’ll learn about the cultivation of different spices and how they are used in specific types of cuisines. Drive to Alleppey, where you’ll board the houseboat for overnight cruise of the famed Kerala backwaters. Along the way you will pass rice fields, tiny villages and women completing household tasks such as laundry and washing utensils. You will disembark to wander in the villages and talk to the people, getting a sense of what life is like here. This is a quintessential Kerala experience. After breakfast, transfer to the Cochin airport to board your flight and begin the journey home. This is a suggested South India itinerary—we’d be happy to customize an itinerary to fit your needs. Whether you prefer a shorter or longer journey, would like to include other parts of India or simply need something to fit your budget, please contact us at 877- 255-7438 or email us at info@geringerglobaltravel.com to discuss how we can create a personalized India tour for you.